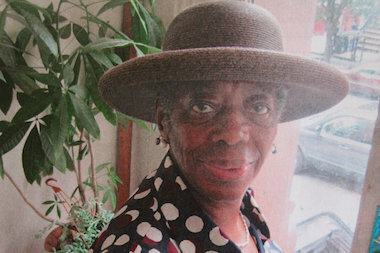 Bedford-Stuyvesant residents are calling for a street sign honoring community leader Catherine Arline, who died on Oct. 24. BEDFORD-STUYVESANT — Hundreds of neighbors, politicians and police officers paid their respects Thursday to a Bed-Stuy activist who died last week, with requests made to rename a block of Quincy Street in her honor. Tears flowed at the memorial service for Catherine Arline, 77, who served as president of the 81st Precinct’s Community Council and worked with its board for more than 18 years. She stepped down from her post in May. Attendees described Arline as a figurehead of Bedford-Stuyvesant, a familiar face in the neighborhood who had her hand in countless organizations promoting the growth of the community and its youth. One speaker at the Brown Memorial Baptist Church service, who identified himself as a close family friend, called for an honorary street sign in Arline’s memory on the block of Quincy Street between Malcolm X Boulevard and Patchen Avenue. His appeal was met by a standing ovation, raised arms and thundering applause from guests. “She was a hero and very much ahead of her time in thinking of community revitalization,” said Brenda Fryson, founder of the civic group the Brownstoners of Bedford-Stuyvesant. The Ahoskie, North Carolina native helped establish the collaboration of different community strongholds from clergy to civic organizations following her arrival in Brooklyn in 1959. Mourners expressed their gratitude on Thursday, with more than a dozen speakers recounting Arline’s investment and interest in their lives, starting in their youth. They recalled her tireless work and ability to remember everyone’s birthdays. As everyone's "aunt," she treated all equally, whether they were police officers or teens in the neighborhood, one speaker said. “She gave her life to kids on the block,” Kambui Olujimi told DNAinfo. Olujimi lived in the apartment beneath Arline's for 20 years and said he was “like a son” to her. “She took her time to talk to people about caring. She brought us food when we didn’t have any. She taught us love, to love ourselves and each other,” he said. In addition to her work with the 81st Precinct and her influence on its Youth Explorers Program, Arline served as president for the Quincy Street Co-Operative Block Association and advisory boardmember for the Kingsboro Addiction Treatment Center. She helped found the Neighborhood Housing Services of Bedford-Stuyvesant, which focuses on home ownership and the availability of affordable housing in the area. Arline died on Oct. 24, following a heart attack sources said. She is survived by four siblings. Local politicians, including Councilman Robert Cornegy, Sen. Velmanette Montgomery and Assemblywoman Annette Robinson paid tribute to Arline’s persistence and influence in working with elected leaders.